# – 2003,Thomas C. Kramer, Water Car-Part 7: MIT’s Plasmatron! 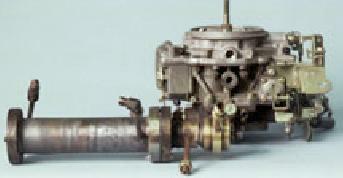 In 1999 MIT researchers headed by Leslie Bromberg invented and patented a device that is supposed to attach to a carburetor that dissociates fuel via a plasma arc into a hydrogen rich fuel mix.Basically they ran gasoline through a plasma arc, causing it to dissociate some of the hydrogen before being sucked into the engine.In their experimental system they used metal electrodes that did require occassional replacement. To get better engine performance they needed to blast about 25% of the fuel, but this did have very positive results on emissions and fuel consumption. They also experimented with different fuels being zapped through the plasma arc but they haven’t pubically divulged these results yet. Now comes the BIG question.Did they ever use water? I don’t know.But here is an idea that you might want to try. It seems to me that one of the simplest ways of getting a water plasma into an engine is to make it at the carburetor, like in the plasmatron example.But this requires the production of significant amounts of gas from a plasma arc as quickly as possible and on demand.Can this be done using water? I believe so, but it requires gaseous water (steam or very fine mist) at pressure and a permanent arc zone using metal electrodes. Steam is a bit difficult to make on engine start-up but can be easily made from recycled exhaust heat for continuous running engines. An electric heater can be used for start-up generation.But this is not too practical for a car, as you want to hop in and go. There are a number of different types of solenoid actuated fuel injectors that create micron sized water molecules in very fine mists that are ejected at pressure and can be easily focused on a plasma reaction zone. The neat thing about this design is that it can be small enough that multiple injectors can be bundled together to produce enough dissociated gas to run an engine. The firing of the injectors and plasma electrodes is also easily timed to an engine rpm’s.And I can wrap an electromagnet around the reactor tube right after the electrode. And any extra water vapor in the cylinders just adds to steam expansion, so that is a good thing too. PS: Please visit Prof. Santilli’s websites listed below to learn more about “PlasmaArcFlow Reactors” and his hadronic approach to nuclear, chemical and biological systems. Really amazing stuff if you are into basic math and science. Prof. Ruggero Santilli has been nominated for a Nobel Prize for his contributions to mathematics, physics, nuclear physics, chemistry and astro-physics/cosmology.He has one of the most brilliant minds of our time and is well worth investigating as he has shaken the very foundations of quantum mechanics and other commonly held beliefs. it must be compact and lightweight, be easily controllable, and be able to respond rapidly to changes in fuel demand. The arc operates at powers ranging from 500 to 2100 watts. The residence times in the reactor were very short (around 200 milliseconds in most cases), and yet significant amounts of hydrogen were produced. MIT’s “Plasmatron” operates at temperatures of over 2,000 oC, and the amount of hydrogen produced is around 80-90%. The main disadvantage with plasma reforming is its dependency on electrical power. MIT hopes to lower the need for electricity to 5% of the fuel’s combustibility caloric value through heat recycling and a better reactor design; today it is 20%. Creates hydrogen on the go from fuel, using plasma technology.Three MIT professors, with DOT funding, have come up with a device that resembles Paul Pantone’s Geet.Patents predate Pantone’s work.Have licensed to automobile supplier, Arvin-Meritor. It means that we can run an engine with just water as fuel, cracked / processed in the Plasmatron !!! what do you need more to be convinced?!? Gasoline, diesel, and turbine engines could soon burn cleaner or be more fuel efficient through the application of Plasma Assisted Combustion, a technology originated and developed at Los Alamos National Laboratory, and now poised to enter the marketplace. The Laboratory has entered into a Cooperative Research and Development Agreement with PerriQuest Defense Research Enterprises, LLC to advance the technology for commercial refinement and implementation. PerriQuest, based in Meriden, CT, Los Alamos, and Idaho National Laboratory are collaborating on the research and development of Plasma Assisted Combustion, under a licensing agreement with Los Alamos, for turbine and internal combustion engine applications. Los Alamos scientist Louis Rosocha and his team have been working on the technology for about four years, with the goal of making fuel-efficient or cleaner burning engines through more complete combustion. The technology consists of an electronic device that can be attached to an existing fuel injector that applies electrical voltage to the atomized fuel stream prior to combustion — generating a plasma in the fuel. This effect essentially breaks down the long chains of hydrocarbons in the fuel into smaller parts – allowing the fuel to be burned more completely, resulting in more miles per gallon, or reducing harmful emissions. “The research was really driven by market needs,” said Rosocha. 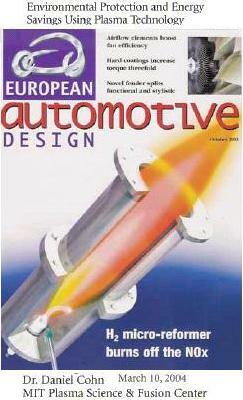 “In 2004, regulations were announced about air pollutants by all vehicles. In the future, air pollutants by vehicles, on- and off-road, are supposed to be more highly regulated. We knew that this was going to create a great opportunity to develop a technology that would supply the demand for cleaner burning vehicles. So, we decided to see if we could do something about it.” With fuel prices at all-time highs, the need for better fuel efficiency is also market driven, but the technology is limited. “The technology does produce cleaner emissions, and can lead to better fuel efficiency, but probably not at the same time,” said Rosocha. “Maybe if Mother Nature was super-kind you might get both.” PerriQuest founder and CEO, Nicholas V. Perricone said that his company, which routinely works with the U.S. Government on defense technologies, is dedicated to turning the plasma combustion technology into a commercial product that will improve turbine and internal combustion engines. Abstract — A fast pulsed nonthermal plasma reactor includes a discharge cell and a charging assembly electrically connected thereto. The charging assembly provides plural high voltage pulses to the discharge cell. Each pulse has a rise time between one and ten nanoseconds and a duration of three to twenty nanoseconds. The pulses create nonthermal plasma discharge within the discharge cell. Accordingly, the nonthermal plasma discharge can be used to remove pollutants from gases or break the gases into smaller molecules so that they can be more efficiently combusted. Abstract — The present invention comprises a field enhanced electrode package for use in a non-thermal plasma processor. The field enhanced electrode package includes a high voltage electrode and a field-enhancing electrode with a dielectric material layer disposed in-between the high voltage electrode and the field-enhancing electrode. The field-enhancing electrode features at least one raised section that includes at least one injection hole that allows plasma discharge streamers to occur primarily within an injected additive gas. Abstract — Apparatus and method for enhancing combustion comprises an enclosure defining an opening for introduction of a gas and openings for the introduction of air, with a nozzle in the opening for introduction of a fuel gas into the enclosure. First and second electrodes are located in the enclosure, the first and second electrodes being coated with dielectric material, and being connected to an electrical power supply. With electrical power applied to the first and second electrodes and with the fuel gas sprayed into the enclosure, an atmospheric pressure plasma created by a dielectric barrier discharge is produced in the enclosure that cracks the fuel gas prior to its mixing with air introduced through the openings for the introduction of air. Abstract — A device that uses electrical discharges/nonthermal plasmas in a gaseous medium to activate a fuel or fuel-oxidizer mixture to promote more effective and efficient combustion, in which a dielectric barrier discharge or silent discharge plasma is used to break up larger organic molecules (the fuel) into smaller ones that are more easily and completely combusted. 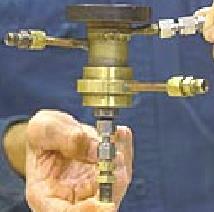 The discharge also creates free radicals that promote more efficient combustion. The device is a cylindrical, coaxial (cylinder in a cylinder) dielectric barrier discharge/silent discharge plasma reactor. 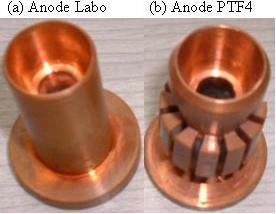 It includes two conducting electrodes, one or both of which are covered by a dielectric material. The electrodes are separated by a thin, gas-containing space. A high voltage is applied to the electrodes to create electric discharge streamers in the gas. 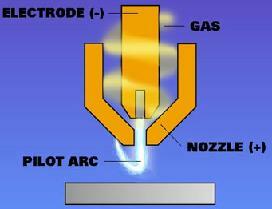 The discharges are the source of the nonthermal plasma. Abstract — A device for processing gases includes a cylindrical housing in which an electrically grounded, metal injection/extraction gas supply tube is disposed. A dielectric tube surrounds the injection/extraction gas supply tube to establish a gas modification passage therearound. Additionally, a metal high voltage electrode circumscribes the dielectric tube. The high voltage electrode is energizable to create nonthermal electrical microdischarges between the high voltage electrode and the injection/extraction gas supply tube across the dielectric tube within the gas modification passage. An injection/extraction gas and a process gas flow through the nonthermal electrical microdischarges within the gas modification passage and a modified process gas results. Using the device contaminants that are entrained in the process gas can be destroyed to yield a cleaner, modified process gas. Also, a modified process gas or gas/vapor mixture can be generated and can be combusted more efficiently and with the emission of less pollution. PLASMA is also a very good solution to reduce wastes, plants are already running in Japan, Hawai, … : See dedicated page on this website, in ‘HELPING OTHERS’ part. ‘WASTE GASIFICATION’.